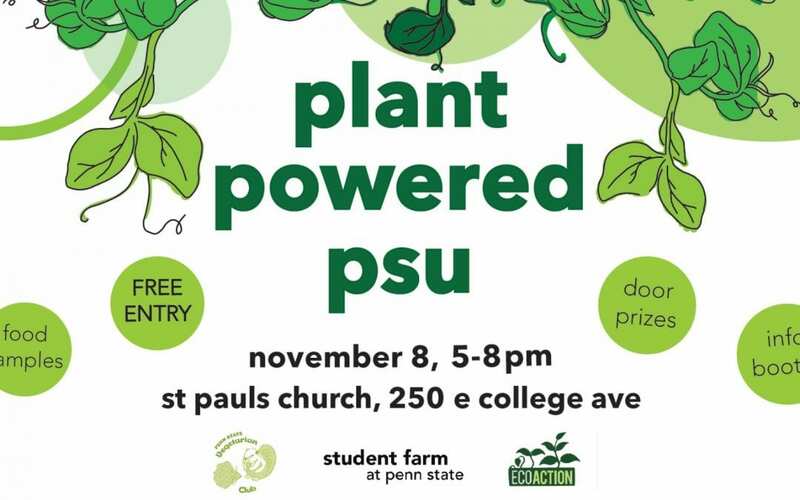 Plant Powered PSU is an upcoming event featuring plant-based foods and interactive learning opportunities for Penn State students and community members alike. The event will be located at St. Paul’s United Methodist Church at 250 E. College Ave. on November 8 from 5:00 pm – 8:00 pm and is free admission. “Plant-based foods are becoming increasingly popular and also more available around State College, so we want to highlight these foods while also teaching people about the environmental and health benefits to eating increasingly plant-based,” said Katie Wasilko, event co-planner and member of EcoAction Club. Plant Powered PSU will feature local vendors in attendance to showcase the availability of plant-based foods located in the State College area. It is intended for anyone who has ever been curious about what some of the many meat alternatives actually taste like or about how to prepare simple plant-based meals that are quick and delicious. The event will also feature drawings for door prizes. Attendees are also invited to bring a non-perishable food item to donate to the Lion’s Pantry and will be entered into a special drawing. Entertainment will be provided by PSUkulele, the Penn State Ukelele Club. “The Drawdown project identifies plant-rich diets as one of the top five changes we can make to significantly reduce greenhouse gas emissions, so our hope in planning this event with these student organizations is to show people how easy and how delicious this personal choice can be,” said Madison McCormick, one of the RPTM course event planners. Project Drawdown represents a group of researchers who have identified and ranked solutions to curb greenhouse gas emissions, and Penn State is planning to host the international Drawdown conference in fall of 2019. Plant Powered PSU is hosted by EcoAction Club, Student Farm Club, the Penn State Vegetarian Club, and students in an event planning class in Recreation, Park and Tourism Management. The mission of these groups in hosting Plant Powered PSU is to educate students and the public about the benefits of enjoying plant-based meals and plant-based diets. Each semester, RPTM 356 students collaborate with 10 local non-profit organizations, campus organizations and state parks to plan, promote, implement and evaluate special events. Generally free and available for to the public to enjoy, students acquire practical event planning experience, while agencies benefit from a special event. The class instructor is Kathleen Raupach, MS, kjr103@psu.edu.